Last week’s news that the Canadian Supreme Court had struck down Canada’s law against assisted suicide is an object lesson. The justices have become the latest poster children for what is wrong with the world. I wish to consider just two of these serious wrongs, and to identify one inevitable consequence. Finally, with help from King Alfred the Great, I will suggest that there is only one way forward. When a country has a law passed by its representative legislature which prohibits assisted suicide, and a court summarily overturns that law based on nothing but its own interior lights, then democracy has died in that country. Of course, democracy has already died in quite a few countries which used to be quite proud of their democratic heritage. Canada’s large neighbor to the south, the United States, has already provided numerous indicators of the same. I admit that democracy is hardly essential for a political order to be conducive to the common good. In fact, I doubt that democracy has actually ever been achieved. Has there ever been a society in which everyone was permitted to vote, and in which every vote counted equally? More to the point, different people in different cultures may establish all kinds of arrangements for the conduct of public affairs, of which democracy (including its step child, the republic) is but one. In any case, the common good itself depends upon far more than politics. Nonetheless, there are many who ought to find the death of democracy troubling, especially if they live in a kind of cultural mind warp. One such “warp” is the loud and constant insistence that our nations are truly democratic societies. To live in this “warp”, we need only to assume that a few justices in a high court represent the will of the demos (the people) better than the people represent themselves. Let us Pray for an end to the Spiritual Emptiness that has consumed generations of our leadership and return to the faith filled principles of the founders of our country. Let us pray each day. All-powerful and ever-living God, shine with the light of your radiance on a people who live in the shadow of death. Address urban decay–support families and communities suffering from mental illness, broken families and a desire for infamy. Strengthen them by the reinforcement of christian values to create a better public policy. Let us pray for new and good leadership in our government. Let us pray for new leadership in our government. Note: The guideline for these words are from the “Liturgy of the Hours,” said by all Secular Franciscans each day. New video reveals ‘a lot’ . . . In a devastating new undercover video, released today by the Center for Medical Progress, the chief executive of an tissue-procurement company reports that Planned Parenthood supplies “a lot” of intact cadavers of aborted babies, and laughs at the shocked reactions of technicians who see the bodies. Cate Dyer, the head of California-based StemExpress, tells an undercover interviewer that “lab techs freak out and have meltdowns” when they see the intact bodies of aborted babies. StemExpress had sought unsuccessfully to prevent release of the damaging video. Dyer speaks at some length on the video about the business relationship between her company and Planned Parenthood, saying that “they are a volume institution.” She says that her company has a heavy demand for fetal tissues, which Planned Parenthood clinics can provide. The Center for Medical Progress also notes that intact fetal cadavers, if they are to be suitable for medical research, are probably born alive before being harvested. In the course of the video—the 8th in a series of exposes of the fetal-tissue business- Dyer also mentions that she has seen serious hygienic problems in some other abortion clinics. She refers to “rampant, rampant problems with bacteria” at clinics—apparently not those affiliated with Planned Parenthood. In a related development, the Catholic Medical Association, the largest association of Catholic physicians and health-care professionals in the United States, has called upon the American Medical Association and all other medical organizations to condemn fetal organ trafficking. In this pastoral letter released on March 25, 2014, Bishop James Conley of Lincoln, Nebraska, has challenged the faithful to embrace married love and to reject the use of birth control. Twenty years ago, Blessed Mother Teresa of Calcutta stood before the President of the United States, before senators and congressmen, before justices of the United States Supreme Court. She spoke about her work among the world’s poor. She spoke about justice and compassion. Most importantly, she spoke about love. Sacrifice is the language of love. Love is spoken in the sacrifice of Jesus Christ, who poured out his life for us on the cross. Love is spoken in the sacrifice of the Christian life, sharing in Christ’s life, death, and resurrection. And love is spoken in the sacrifice of parents, and pastors, and friends. We live in a world short on love. Today, love is too often understood as romantic sentimentality rather than unbreakable commitment. But sentimentality is unsatisfying. Material things, and comfort, and pleasure bring only fleeting happiness. The truth is that we are all searching for real love, because we are all searching for meaning. Love—real love—is about sacrifice, and redemption, and hope. Real love is at the heart of a rich, full life. We are made for real love. And all that we do—in our lives, our careers, and our families, especially— should be rooted in our capacity for real, difficult, unfailing love. But today, in a world short on love, we’re left without peace, and without joy. Husbands and wives are made to freely offer themselves as gifts to one another in friendship, and to share in the life-giving love of God. He created marriage to be unifying and procreative. To join husband and wife inseparably in the mission of love, and to bring forth from that love something new. Contraception robs the freedom for those possibilities. God made us to love and to be loved. He made us to delight in the power of sexual love to bring forth new human beings, children of God, created with immortal souls. Our Church has always taught that rejecting the gift of children erodes the love between husband and wife: it distorts the unitive and procreative nature of marriage. The use of contraception gravely and seriously disrupts the sacrificial, holy, and loving meaning of marriage itself. The Church continues to call Catholic couples to unity and procreativity. Marriage is a call to greatness—to loving as God loves—freely, creatively, and generously. God himself is a community of love—the Father, the Son, and the Holy Spirit. Christian marriage is an invitation to imitate, and to know, and to share in the joyful freedom of God’s love, an echo of the Holy Trinity. God is present in every marriage, and present during every marital embrace. He created sexuality so that males and females could mirror the Trinity: forming, in their sexual union, the life-long bonds of family. God chose to make spouses cooperators with him in creating new human lives, destined for eternity. Those who use contraception diminish their power to unite and they give up the opportunity to cooperate with God in the creation of life. As Bishop of Lincoln, I repeat the words of Bishop Flavin. Dear married men and women: I exhort you to reject the use of contraception in your marriage. I challenge you to be open to God’s loving plan for your life. I invite you to share in the gift of God’s live-giving love. I fervently believe that in God’s plan, you will rediscover real love for your spouse, your children, for God, and for the Church. I know that in this openness to life, you will find the rich adventure for which you were made. Our culture often teaches us that children are more a burden than a gift—that families impede our freedom and diminish our finances. We live in a world where large families are the objects of spectacle and derision, instead of the ordinary consequence of a loving marriage entrusted to God’s providence. But children should not be feared as a threat or a burden, but rather seen as a sign of hope for the future. In 1995, Blessed John Paul II wrote that our culture suffers from a “hedonistic mentality unwilling to accept responsibility in matters of sexuality, and… a self-centered concept of freedom, which regards procreation as an obstacle to personal fulfilment. ”3 Generous, life-giving spousal love is the antitode to hedonism and immaturity: parents gladly give up frivolous pursuits and selfishness for the intensely more meaningful work of loving and educating their children. In the Diocese of Lincoln, I am grateful for the example of hundreds of families who have opened themselves freely and generously to children. Some have been given large families, and some have not. And of course, a few suffer the very difficult, hidden cross of infertility or low fertility. The mystery of God’s plan for our lives is incomprehensible. But the joy of these families, whether or not they bear many children, disproves the claims of the contraceptive mentality. Dear brothers and sisters, Blessed John Paul II reminded us that, “man is called to a fullness of life which far exceeds the dimensions of his earthly existence, because it consists in sharing the very life of God.”4 The sexual intimacy of marriage, the most intimate kind of human friendship, is a pathway to sharing in God’s own life. It is a pathway to the fullness of our own human life; it is a means of participating in the incredible love of God. Contraception impedes our share in God’s creative love. And thus it impedes our joy. The joy of families living in accord with God’s plan animates and enriches our community with a spirit of vitality and enthusiasm. The example of your friends and neighbors demonstrates that while children require sacrifice, they are also the source of joy, meaning, and of peace. Who does not understand the great gift of a loving family? Yes, being lovingly open to children requires sacrifice. But sacrifice is the harbinger of true joy. Dear brothers and sisters, I invite you to be open to joy. Of course, there are some true and legitimate reasons why, at certain times, families may discern that more children would become a serious burden to them. For families with serious mental, physical, or emotional health problems, or who are experiencing dire financial troubles, bearing children might best be delayed. The Catechism of the Catholic Church teaches that couples must have “just” reasons to delay childbearing. For couples facing difficulties of various kinds, the Church recommends Natural Family Planning: a method for making choices about engaging in fruitful sexual relations. Natural Family Planning does not destroy the power to give life: instead, it challenges couples to discern prayerfully when to engage in life-giving sexual acts. It is an integrated, organic and holistic approach to fertility care. Natural Family Planning is a reliable and trustworthy way to regulate fertility, is easy to learn, and can be a source of unity for couples. To be sure, using NFP requires sacrifice and patience, but sacrifice and patience are not obstacles to love, they are a part of love itself. Used correctly, NFP forms gentle, generous husbands, and selfless, patient wives. It can become a school of virtuous and holy love. Those who confine sexual intimacy to the infertile times of the month are not engaging in contraceptive practices. They do not attempt to make a potentially fertile act infertile. They sacrificially abstain during the fertile time precisely because they respect fertility; they do not want to violate it; they do not want to treat the gift of fertility as a burden. In some relatively rare instances, Natural Family Planning is used by couples with a contraceptive mentality. Too often couples can choose to abstain from fertility by default, or out of fear of the consequences of new life. I encourage all couples who use Natural Family Planning to be very open with each other concerning the reasons they think it right to limit their family size, to take their thoughts to God, and to pray for his guidance. Do we let fear, anxiety, or worry determine the size of our families? Do we entrust ourselves to the Lord, whose generosity provides for all of our needs? Dear friends, I exhort you to openness in married life. I exhort you to trust in God’s abundant providence. No Catholic healthcare provider, in good conscience, should engage in the practice of medicine by undermining the gift of fertility. There is no legitimate medical reason to aid in the acts of contraception or sterilization. No Catholic physician can honestly argue otherwise. Healthcare is the art of healing. Contraception and sterilization may never be considered healthcare. Contraception and sterilization denigrate and degrade the body’s very purpose. Fertility is an ordinary function of health and human flourishing; and an extraordinary participation in God’s creative love. Contraception and sterilization stifle the natural and the supernatural processes of marriage, and cause grave harm. They treat fertility as though it were a terrible inconvenience, or even a physical defect that needs to be treated. Contraception attempts to prevent life from the beginning, and when that fails, some contraception destroys newly created life. 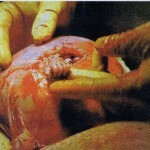 Many contraceptives work by preventing the implantation of an embryonic human being in the uterus of his or her mother. Contraception is generally regarded by the medical community as the ordinary standard of care for women. The Church’s teachings are often regarded as being opposed to the health and well-­?being of women. But apart from the moral and spiritual dangers of contraception, there are also grave physical risks to the use of most chemical contraceptives. Current medical literature overwhelmingly confirms that contraception puts women at risk for serious health problems, which doctors should consider very carefully. Some women have health conditions that are better endured when treated by hormonal contraceptives. But the effects of contraception often mask the underlying conditions that endanger women’s health. Today, there are safe, natural means of correcting hormonal imbalances, and solving the conditions that are often treated by contraception. Contraception is an unhealthy standard of care. All doctors can do better. Catholic physicians are called to help their patients and their colleagues learn the truth about the dangers of contraception and sterilization. The good example of a physician who refuses to prescribe contraceptives and perform sterilizations or a pharmacist who refuses to distribute contraceptives in spite of antagonism, financial loss, or professional pressure is an opportunity to participate in the suffering of Jesus Christ. I am grateful for the Catholic physicians and pharmacists who evangelize their patients and colleagues through a commitment to the truth. Tragically, a majority of people in our culture and even in our Church, have used contraception. Much of the responsibility for that lies in the fact that too few have ever been exposed to clear and consistent teaching on the subject. But the natural consequences of our culture’s contraceptive mentality are clear. Mother Teresa reflected that “once living love is destroyed by contraception, abortion follows very easily.”7 She was right. Cultural attitudes that reject the gift of life lead very easily to social acceptance for abortion, for no-­?fault divorce, and for fatherless families. For fifty years, America has accepted the use of contraception, and the consequences have been dire. Dear brothers and sisters, I encourage you to read the encyclical by Pope Paul VI, Humanae Vitae with your spouse, or in your parish. Consider also Married Love and the Gift of Life, written by the United States Conference of Catholic Bishops. Dear brother priests, I encourage you to preach about the dangers of contraception, and to visit with families in your parish about this issue. If you have prescribed contraception, dear brothers and sisters, the merciful love of God awaits. Healing is possible—in the sacrament of penance. If you have used or supported contraception, I pray that you will stop, and that you will avail yourself of God’s tender mercy by making a good heartfelt confession. Today, openness to children is rarely celebrated, rarely understood, and rarely supported. To many, the Church’s teachings on life seem oppressive or old-fashioned. Many believe that the Church asks too great a sacrifice. But sacrifice is the language of love. And in sacrifice, we speak the language of God himself. I am calling you, dear brothers and sisters, to encounter Christ in your love for one another. I am calling you to rich and abundant family life. I am calling you to rejoice in the love, and the sacrifice, for which you were made. I am calling your family to share in the creative, active love of the Father, the Son, and the Holy Spirit. I pray that in true sacrifice, each of you will know perfect joy. 1 Blessed Teresa of Calcutta. National Prayer Breakfast, 1994. 2 Glennon P. Flavin, Pastoral Letter to Catholic Couples and Physicians. September 26, 1991. 3 Blessed John Paul II. Evangelium Vitae, 13. 7 Blessed Teresa of Calcutta. National Prayer Breakfast, 1994.